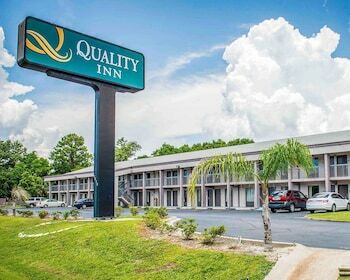 When you stay at Quality Inn & Conference Center in Panama City, you'll be connected to the convention center, within a 15-minute drive of Panama City Mall and Panama City Marina. Featured amenities include complimentary wired Internet access, a 24-hour business center, and dry cleaning/laundry services. Free self parking is available onsite. When you stay at this cabin in Panama City Beach, you'll be within a 10-minute drive of Camp Creek Golf Club and Camp Helen State Park. Located in Panama City Beach (Rosemary Beach), this villa is convenient to Camp Creek Golf Club and Camp Helen State Park. When you stay at this apartment in Panama City Beach, you'll be on the beach, within a 10-minute drive of Pier Park and Gulf World Marine Park. With a stay at this apartment in Panama City Beach, you'll be a 2-minute drive from Gulf World Marine Park and 5 minutes from Pier Park. When you stay at this condo in Panama City Beach, you'll be on the beach, a 3-minute drive from Gulf World Marine Park and 6 minutes from Pier Park.